Introducing The Savannah Cozy Chapel, the perfect location for your indoor wedding in Savannah! 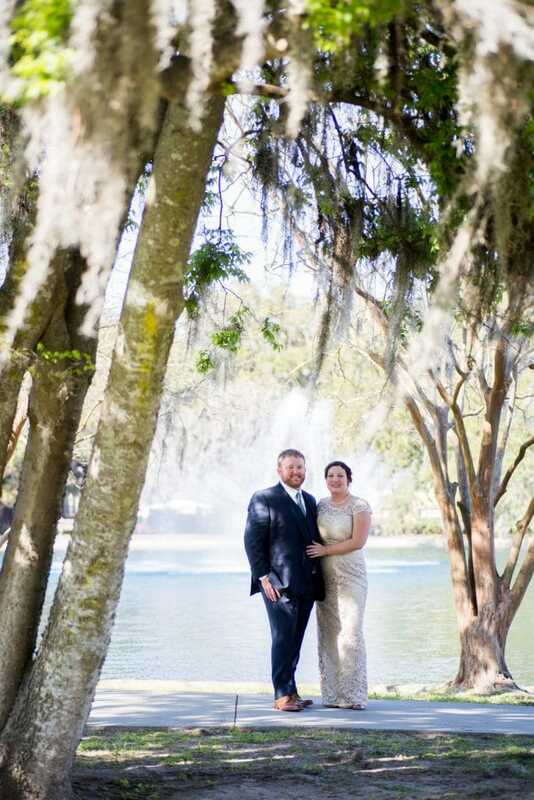 The Savannah Cozy Chapel is a brand new location for your intimate and private non-denominational or non-religious wedding with wedding officiant Tracy Brisson and the Savannah Custom Weddings team. The chapel is a bright storefront in the mid-town, Baldwin Park area, just blocks away from Daffin Park (a great place for wedding portraits!). It is a converted artists’ studio and has a very modern feel. The chapel features lots of natural sunlight and an outside garden with one of the official book birdhouses on the Flannery O’Connor book trail. Inside, the chapel has white walls, a light colored floor, a decorated wedding arch for the perfect background for your ceremony and a ritual table for your customized ceremony elements. We also have large love quotes and signs that you can use for your photos and selfies. The chapel has seating for 20. One of our recently married couples, Renee and Vanadis, joined us for a photo shoot to show you how to have fun in our space! And don’t forget to get your post- ceremony pictures just a few blocks away at Daffin Park! 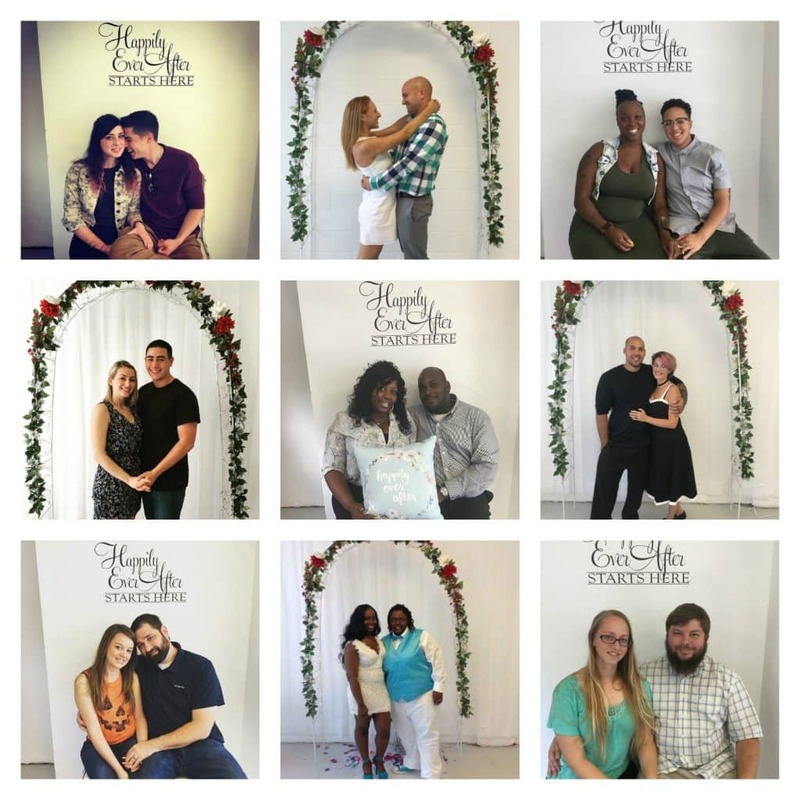 We also hold all of our Signing Services at the Savannah Cozy Chapel where we’ll take an Instagram shareable pic for you! The following are our current rental prices for the Savannah Cozy Chapel. You do not need to rent the chapel if there are no guests over the age of 13. All time periods listed includes chairs and set-up and clean-up for your event. You can also bring desserts and light, non-alcoholic refreshments for your guests for after the ceremony. We have a small conference table where you can lay these out. You must provide all dishes and utensils. You can also rearrange chairs and the aisle to have a first dance! All of our ceremony packages can be hosted at the Savannah Cozy Chapel. ALL Simple Signing Services are held at the chapel. If you are choosing a package with photography, you are welcome to have your ceremony in the chapel and then arrange for a cab or Uber to take you to a park or square where we will meet you for outside photos. If you are purchasing the Popup Elopement Package, you can also choose to have your portraits in our side garden as well as under the wedding arch with props and signs. We know that not everyone has the luxury of having their friends and families close when they are married. We can broadcast your wedding for family members and friends via Facebook Live if you would like, either via our Facebook Page or your personal account. These broadcasts will not be professionally edited videos. If you would like to work with a videographer, we can connect you to someone local. This option is not available for Simple Signing Services. The Savannah Cozy Chapel can also be rented by local groups and professionals for meetings and workshops for commercial purposes, for $50 an hour. It is also available for photo shoots. If you are hosting something more community oriented, we may allow you to use the space for free. Contact us for more information. The Savannah Cozy Chapel is located at 2421 Waters Avenue between Maupas Avenue and 41st Street. You can park on both side streets. The Chapel is open by appointment only. We ask that you enjoy yourself in the chapel, but be courteous of the space and neighbors. All other logistical issues around scheduling, payment, and other similar issues that apply to ceremony packages also apply to the chapel. An overview of these can be found at the bottom of the ceremony package page. Tell me about your ceremony and book your date!